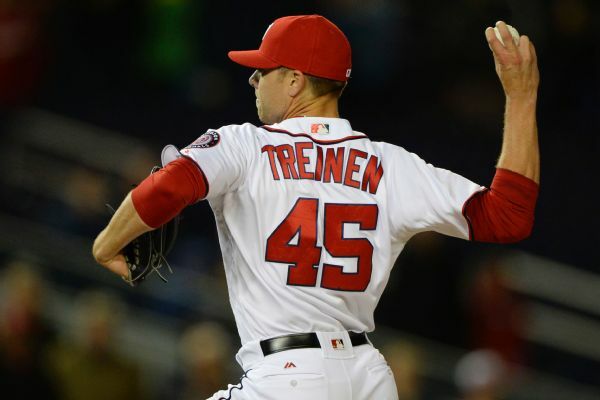 ATLANTA -- The Washington Nationals removed Blake Treinen from the closer's role on Wednesday and will use what manager Dusty Baker said is a "mix and match" plan with right-handers Shawn Kelley and Koda Glover sharing the job. Kelley earned his first save of the season in Tuesday night's 3-1 win over Atlanta after Treinen gave up a run, two hits and two walks while recording only one out in the ninth. Treinen has a 7.11 ERA with three saves in four chances in eight games. He will shift to a setup role. "We're going to put him back more in a role he had success in," Baker said. The Nationals waited until the final day of spring training to announce Treinen as the closer. Earlier in the offseason, Washington failed to sign free agent Mark Melancon. Baker said in spring training he wanted to use one closer instead of a committee approach. He said Wednesday Glover's lack of experience and Kelley's history of elbow problems prevent him from immediately giving either the job. Baker also noted Glover, a 23-year-old rookie, "has been through some things, too" this season. Glover (0-1) has a 3.18 ERA in six games. Kelley (2-0) has a 6.00 ERA this season after appearing in a career-high 67 games in 2016. Glover may be seen as the long-term closer. "Koda has less experience even than Blake," Baker said. "So what you want and what you wish might happen sooner hopefully rather than later, but we've got to win games in the meantime."